In this heightened state of alert, I’m doing what I can about swine flu… which is, basically, not much. Because we as individuals can’t do too much about it besides wash our hands, cover our mouths, exercise, eat healthy, and get enough sleep – all things we should be doing more or less regularly anyway. No, I did my part by cooking up a couple of pounds of pork in the best way I (now) know how – Chinese barbecue style. There’s meaty American barbecue slathered with thick, nostril-clearing sauce. Stripped down Korean barbecue with its more delicate, sweet marinade. And then there’s Chinese barbecue – the best of both worlds. 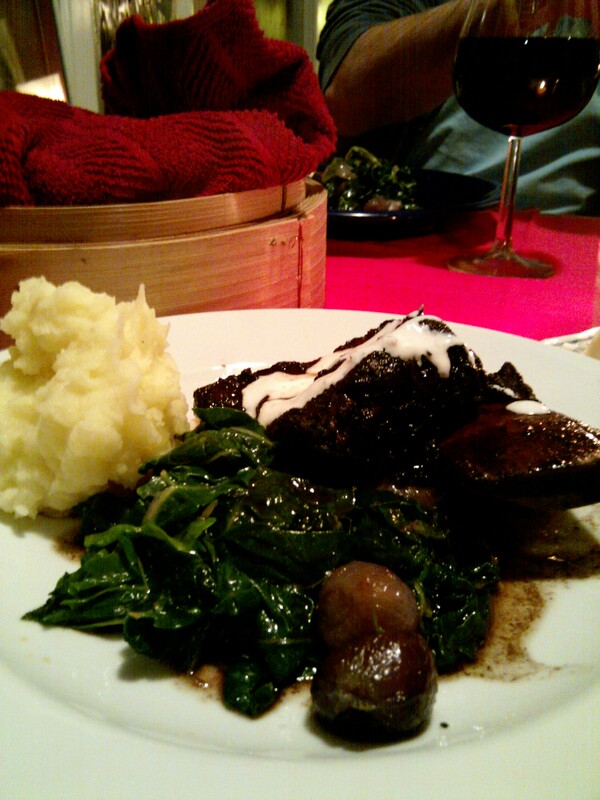 The sauce is thick, but roasted on so that it caramelizes and becomes a part of the meat itself. It is sweet, yet savory; spicy, yet subtle. The flavors of hoisin, soy sauce, rice wine, ginger, and garlic melt together to create an olfactory experience that is enough to make you pause with amazement but not enough to stop you from devouring piece after piece. I grew up eating what’s known as “char siu” pork (pronounced more like “chao sao” in Mandarin) but it was never something I thought about making at home. I don’t remember my mom ever making it, though she would often make Peking duck, something that seems much more fancy (but really isn’t, apparently). Char siu pork is like meatballs – a comfort food that is as natural in leftovers as it is freshly made. In fact, I was most used to it as the filling for my favorite snack – char siu bao, or sweet barbecue pork buns – or as a topping for noodle soup. But I always had it pre-prepared in those dishes, and never really saw the original roast it came from. 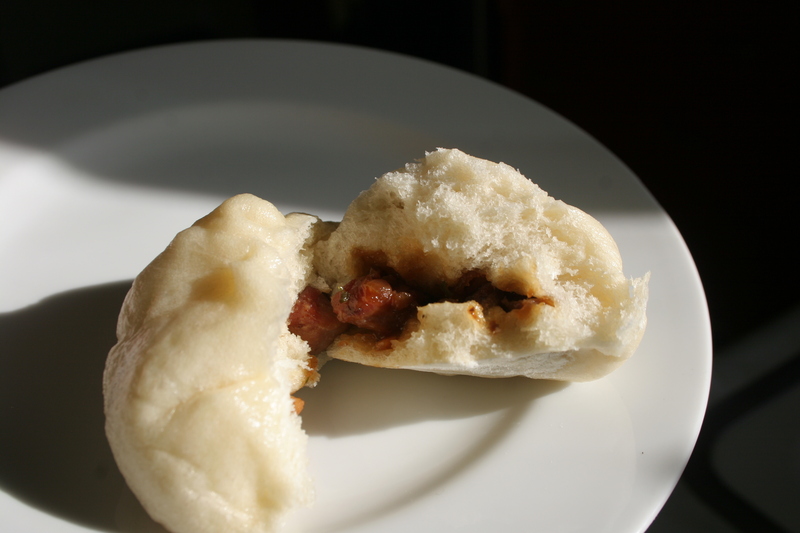 That changed last weekend, when I suddenly decided I needed to make char siu bao. Ironically, I’m too lazy to drive 45 minutes to the asian market to buy ready-made char siu bao, but not too lazy to go to Safeway down the street and then spend a good 6 hours making the damn things from scratch. So I got a couple recipes to reference for both the bao (buns) and the char siu, and had a good old mashup time of it. Cut the pork along the grain into long strips 1.5-2 inches wide and about 6-10 inches long. Combine all marinade ingredients, then place with the pork into large ziploc bags. Make sure the pork is coated evenly and then seal, removing as much air as possible from the bags. 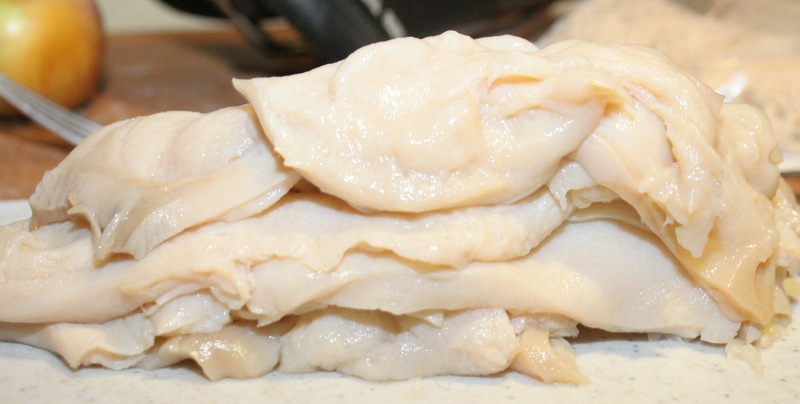 Marinate in the refrigerator overnight (or at least a few hours). Place a rack on the lower third of the oven and preheat to 375 deg. Fill a pan (or two, depending on amount of meat) with 1/2 ” water and place a metal rack over it. I used two 9×13″ pans with cooling racks with slats about 1/2″ apart. 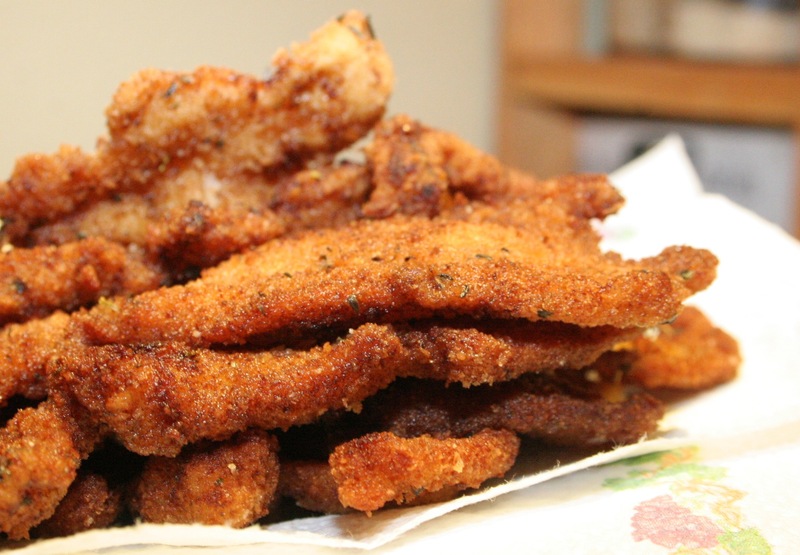 Arrange the meat strips on the rack(s), reserving the marinade in a small pot. I was pleased with how red the outside of the pork got, since a lot of accounts I read claimed that it was difficult to achieve the vibrant red color you see in the stores. Some recipes had red food coloring, which just seemed weird to me. Thankfully, the visual experience matched the taste and smell I was used to. 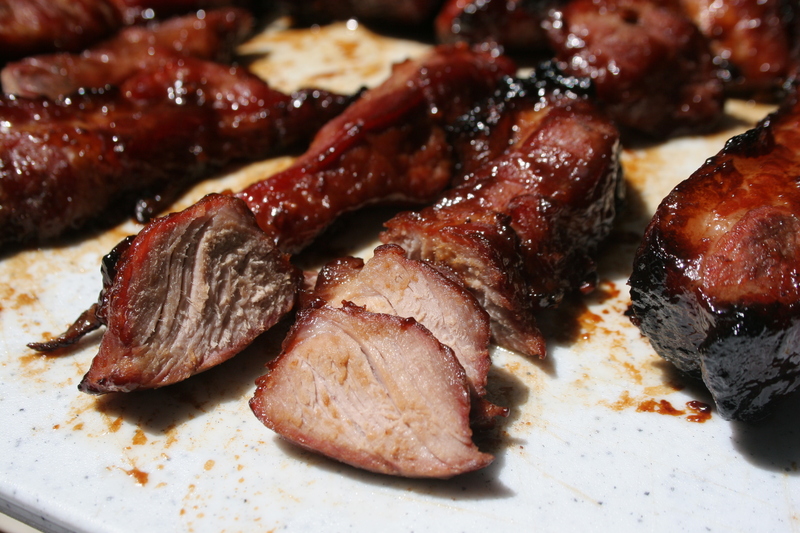 I’m really rather impressed that my first try at making char siu came out so well! Heat the oil in a large wok or skillet. Add the garlic, onion, and scallion and saute until soft but not browned. Add the pork and saute for a minute or two. Add the soy sauce, sugar, and cornstarch mixture and saute quickly until glazed. Allow to cool before filling buns. Unfortunately, the bao wasn’t exactly what I was hoping for – it was basically the kind of bao you would use for normal bao of the ground pork and chives variety, not the fluffy, soft bao I wanted with my sweet char siu. I think I need to look for a bao recipe that uses milk to achieve that. Then there’s also the other kind of char siu bao – baked, and golden colored, which is the kind I grew up with. I’m pretty sure that’s an egg-based bread. 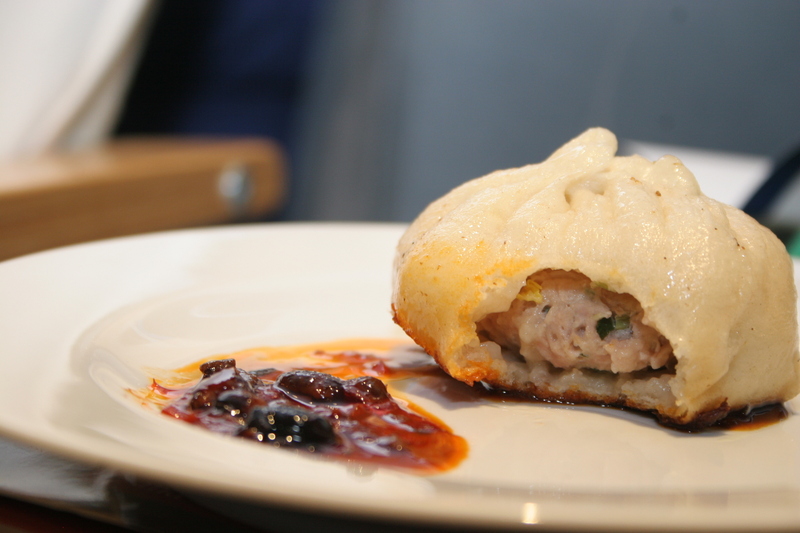 Pork buns are often overlooked by those unfamiliar with Chinese cuisine, overshadowed by the much more common dumplings, also known as “potstickers” when pan-fried. While variations for both abound (e.g. steamed BBQ pork buns, shrimp dumplings), the classic for each is very much the same – a plain dough rolled into rounds and filled with a mixture of ground pork seasoned with garlic, ginger, soy sauce, and sesame oil. Though steaming the buns is delicious, pan-frying makes them delightfully crisp golden brown on the bottom and perfect accompanied with a zesty dipping sauce. 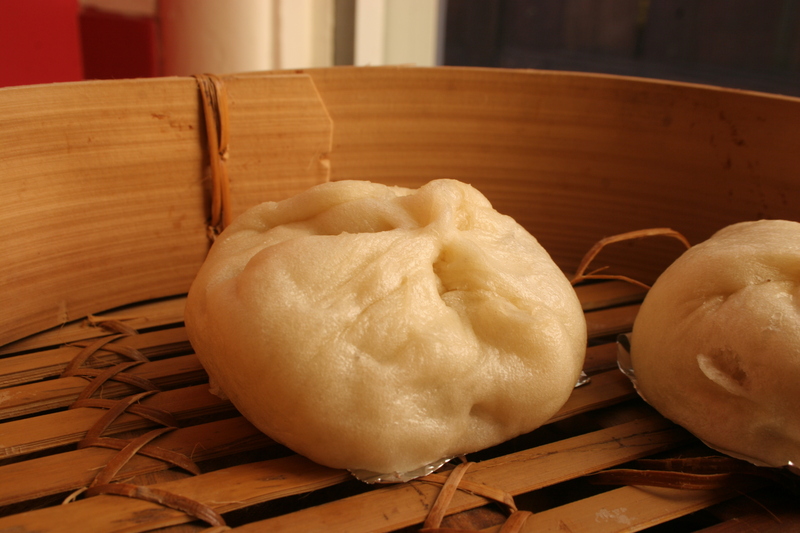 There are two main components to pork buns – the wrappers and the filling. 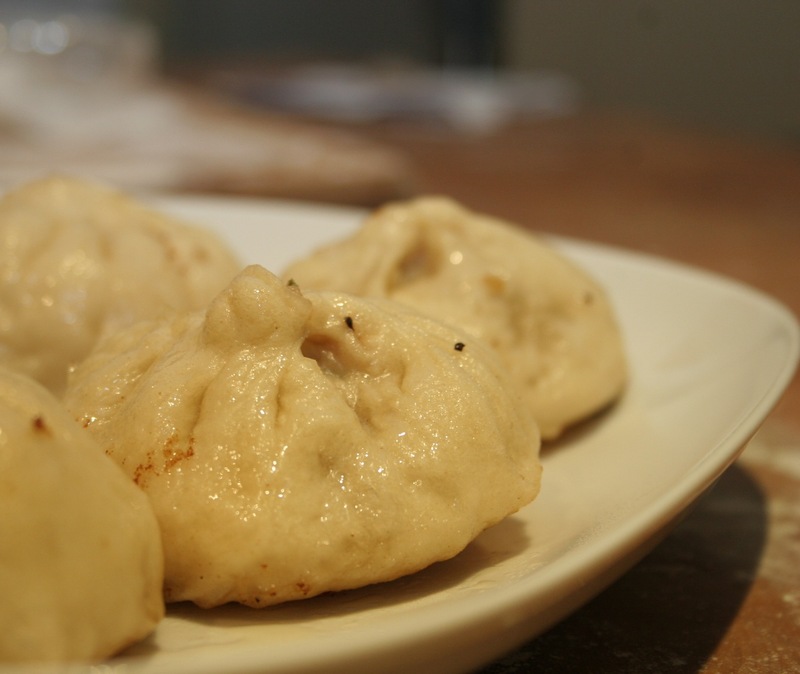 Dumplings can be made with store-bought wrappers (available at any Asian food store) but these buns require leavened dough, which is easy to make. I essentially use a plain recipe for French bread dough from Beth Hensberger’s The Bread Bible. The filling (recipe courtesy of my mom) is also very easy provided you can get Napa cabbage and Chinese chives. Both of these should also be available at Asian food stores. Note that this recipe makes a large number of buns, so you should divide the recipe as needed (1 serving is probably 4-6 buns). Alternatively, you can make all the filling and freeze the portion you don’t use. The dough, however, should probably be made for the number of buns you expect to make that day. Place the hot water in a large mixing bowl and sprinkle the sugar and yeast over the top. Mix to dissolve and let stand 10 minutes until foamy. Add the salt and 2 cups of the bread flour and mix hard with a whisk until smooth. Add the remaining bread flour and the all-purpose flour, 1/2 cup at a time, until a shaggy dough that just clears the side of the bowl is formed. Turn the dough out onto a lightly floured surface and knead until smooth and no longer sticky. Add flour as needed to prevent sticking. Place dough in a deep greased container, cover with plastic wrap, and let rise at cool room temperature for about 2 hours. You can also let the dough rise in the refrigerator for at least 6 hours; it’s best to let the dough return to room temperature before working with it. Once the dough has risen, turn it out onto a well-floured surface and knead a few times until smooth. 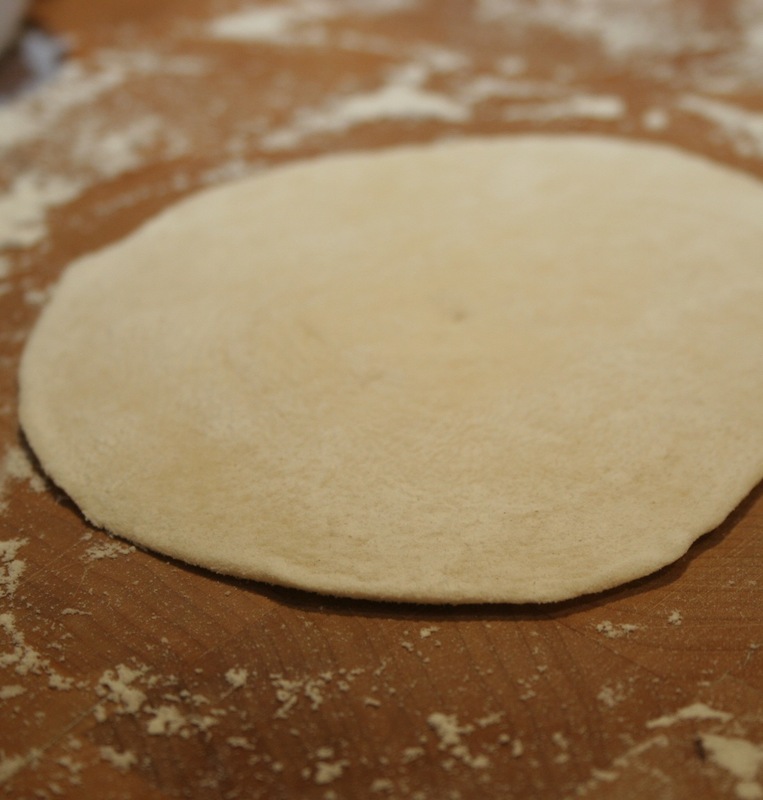 Form the dough into a flat ball, pinch a hole in the center, and stretch the dough into a uniform loop. Continue stretching until the dough rope is about 1 1/2 inches in thickness. 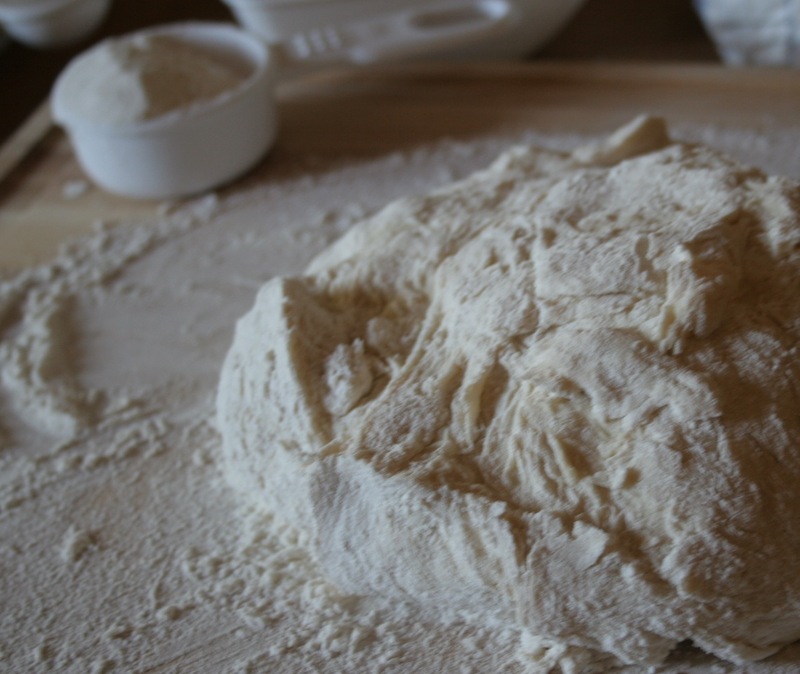 Cut the dough into pieces about 1 inch long, dust with flour, and cover with a damp paper towel. To make a wrapper, lightly flatten a piece of dough with your palm. 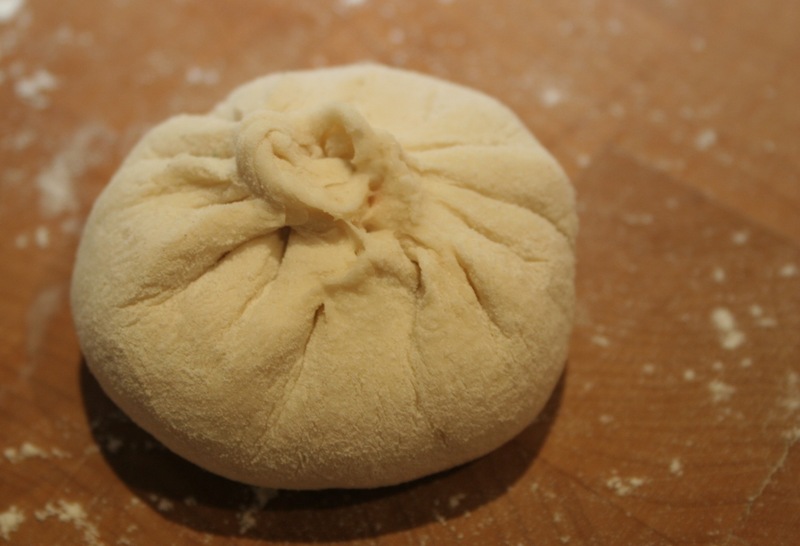 Roll the piece of dough out into a thin, even round using a rolling pin. Place the wrapper flat in your palm and add about a heaping tbsp full of filling in the center. Pinch the edges up into folds towards the center while turning the bun in your hand until all the edges have been pinched up. Make sure the top is sealed, and you’ve got a pork bun! Coat the bottom of a large skillet or wok with a tight fitting lid with a liberal amount of vegetable oil (1-2 tbsp) and heat at medium-high. Place wrapped pork buns in the wok in a single layer making sure that they don’t touch. Fry about 2 minutes or until the bottoms are light golden brown. Add about 3/4 cup of cool water, cover, and cook over medium heat until the water has boiled off almost completely, ~ 6-8 minutes. 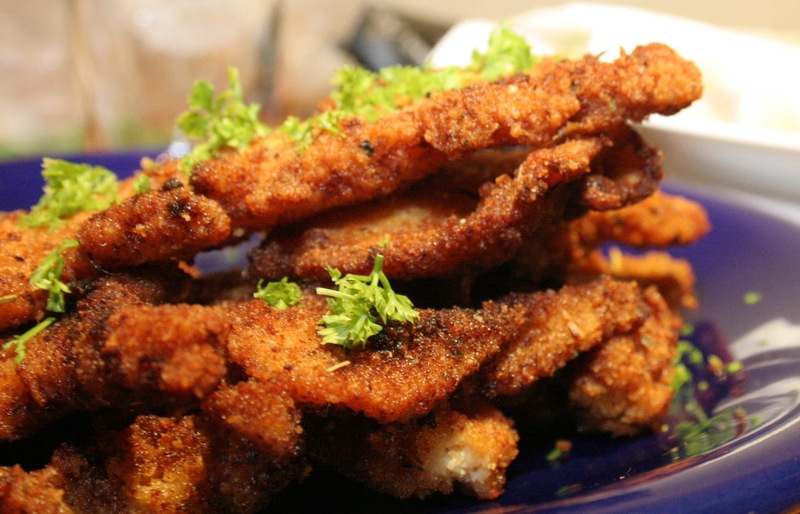 Remove when the bottoms are dark golden brown – cook a little longer if necessary – but be careful not to burn them. Eat while hot and serve with a dipping sauce (see below) if desired. Combine soy sauce, vinegar, and a spicy black bean chili mixture (available at Asian food stores) in about a 4:2:1 ratio. Adjust flavor to taste. Feel free to add sesame oil or ginger if desired. That’s pretty much it! Don’t be intimidated by the seemingly large number of steps. It essentially boils down to: Make dough. Make filling. Wrap filling. Cook buns. Eat buns. The hardest part is wrapping the filling so that the result looks like a bun and acts like a bun. Believe me, it took me about 30 buns before I finally got my mom’s wrapping technique confidently down. But the hardest part is also the most fun part – aside from eating the buns, of course! I’ve received two recipes for short ribs in the past couple weeks (from my mom and Euge) and gave my mom’s recipe a try last weekend. It’s super quick and easy, and, of course, delicious. I almost venture to say that they were almost as good as my mom makes. Don’t worry, Euge – I’ll try your friend’s recipe soon too, and maybe even make both at the same time at some point so there can be a rib-off! The trickiest part of making short ribs is getting the short ribs. First of all, they don’t usually sell short ribs unless maybe if you go to an asian supermarket – in regular supermarkets you usually only find “long” ribs (~6″), and then you have to have them cut into short ribs (~2″). The tricky thing is, most meat counters close around 7 or 8PM, and by close at 8, they mean the butcher leaves at 7, and by leaves at 7, they mean you’re out of luck whenever the butcher shuts off and cleans the equipment, which is usually around 6. It’s probably also a good idea to go to a store where they sell ribs by the pound as opposed to pre-packaged from third parties, because I’m not sure if they’ll cut packages (I decided not to risk another disappointment and went to a place where they sold ribs by the pound, i.e. Andronico’s as opposed to Safeway); you’ll also get better choice and can get exactly the amount you need. 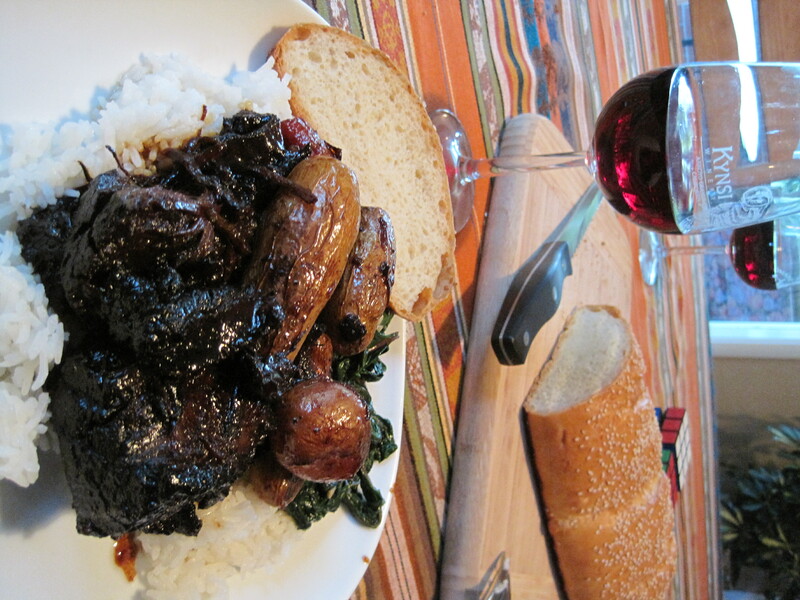 So now that you’ve got the short ribs taken care of, what do you do to them? Combine ribs with marinade in a large airtight ziploc bag and let marinate ~ 1 hr, turning the bag a few times to coat evenly. Heat oil in a large skillet or wok and add ribs, reserving the marinade. Cook over high heat for 1-2 min, turning to brown evenly. Add the reserved marinade, bring to a simmer over low heat, and cook, covered until mostly done, about 7 min, turning ribs once or twice during. Lower heat and add cornstarch mixture, cook until thickened, ~ 2 minutes. Add scallions during the last minute, and serve garnished with more scallions.